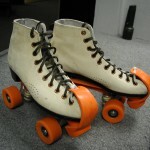 A bicycle helmet and toe stops (quad skates) are required for safety. Speed team members receive a 10% discount in the pro shop. Aaron Hoover, Brian Weidler, Cecil Hickson and Wade Yost who have over 50 years skating experience teach classes-national caliber skaters.